Choose a topic to visit the recommended websites for this book. A sensitive and moving account of the Holocaust, based on survivors' stories and historical fact. Illustrated with archive photographs, maps and documents. Internet links to carefully researched and informative websites. Zanna Davidson has written over fifty books for children, both non-fiction and fiction. Her stories for children include the Fairy Ponies, Fairy Unicorns and Billy and the Mini Monsters series for Usborne. She lives in the countryside in a cottage on the edge of some deep, dark woods with two small boys and her scruffy black dog, Fred. An excellent book ... It tackles a very difficult subject very well and is aimed at children aged 9 and over, but I also think it's good for parents to read to explain to their (older) children. Sensitively handled to be age-appropriate... A vivid and compelling account which will raise many questions in children's minds. 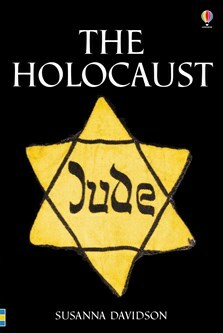 The Holocaust by Susanna Davidson is a sensitively written account... The book contains powerful photographic images and archive documents to help highlight the horrors of the Holocaust. It provides an excellent introduction to the subject whilst handling the topic delicately enough as to not upset children. It’s simple to understand, crams a mass of information into short digestible chunks, and does its very best to explain a seemingly inexplicable event. This was a very sad book. But it was still a good one. The saddest part was when Chaim Hirszman had to shave his own wife's hair. I would rate this book at a 9/10.